I was in Ohakune for the Ruapehu Classic which I cycled yesterday. 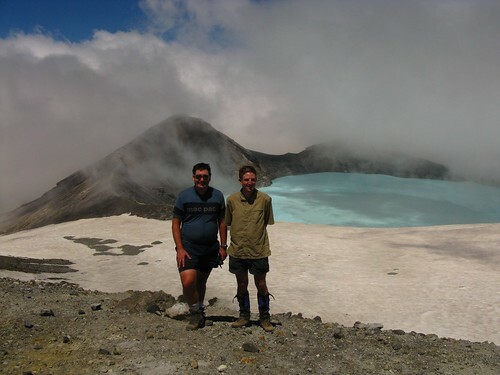 Earlier in the week at work when I was looking at the weather maps and said I would go up Mt Ruapehu’s Crater Lake, my friend and colleague Mike said he would like meet me on Sunday and come along too, well it was more up than along actually :D.
When arriving at Iwikau Village at “the top of the Bruce”, the Bruce Road being the road up to the ski-fields of the Whakapapa side of Mt Ruapehu it was less familiar than it should have been for both of us, considering that we had been here many times before - in winter for snowcraft courses and mid-winter alpine trips with the Wellington Tramping & Mountaineering Club. On this occasion the volcanic rocks were not covered in snow and ice. This side of the mountain, with all the ski-field infrastructure had a relatively industrial appearance. We followed a route up the Rock Garden underneath the Rock Garden and Waterfall Express chair-lifts with the occasional conversation heard above us as others had chosen use the chair-lifts instead a pleasant one hour walk to begin the day. Actually, we must have been the only self-respecting trampers on the mountain today as we did not see anyone else walking from the car-park to the top of the Waterfall Express chair-lift. When we reached the top of the chair-lift it was an industrial looking site with a digger present and construction of a new cafe for the pending winter ski season underway. This is part of the effort to repair damage from arson attacks in early 2009. Choose a easy route - we’re tramping not rock-climbing! 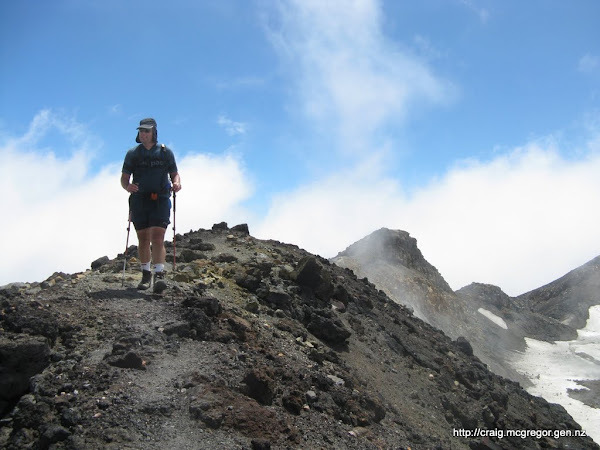 Having not done a lot of tramping recently I certainly was not able to travel as quick as Mike. No problem, I know that Mike likes to play with his camera, so this allowed him plenty of time :D.
Being the height of summer, with the exception of a couple of snow filled gullies there wasn’t any snow to travel over. As we approached Glacier Knob, we most likely chose the harder route by going directly up a scree slope when we could have sidled around it, to ultimately arrive at the same saddle. from the saddle a worn path around to Dome Shelter Equipment Shed. That said, our higher route provided a splendid view of the Summit Plateau and Cathedral Rocks before it was obscured from incoming cloud. Sidling around the side of a hill always feels a bit unnatural to me and when in doubt I always take a spur or ridge straight to the top. Now at over 2600m a conversation ensured about the highest places we had been and how we got there. Craig: This is the highest altitude that I have been at except in a aircraft. Following the worn path from the saddle below Glacier Knob we arrived at Dome Shelter and the sat above a view of the Crater Lake. Not that we could tell this immediately, since the cloud had moved in and surrounded us. As we nibbled our lunch, and some less deliberate high protein insect garnishes the cloud drifted in and out revealing excellent views over the Crater Lake and across to the Cathedral Rocks. we could gather, they had arrived here via Te Heuheu after following the east-most t-bar (if I were a skier I may know what this one is called), and joining Pinnacle Ridge at some point above the pinnacles from which the ridge is named. Graham’s boots were falling apart. 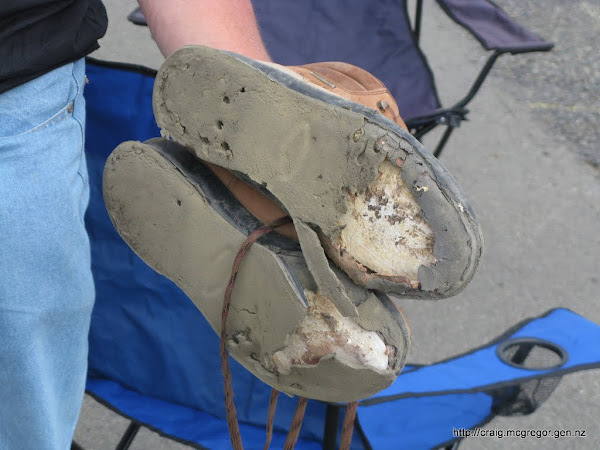 The small hole developing in mine was no contest for his complete adhesive failure on the soles of both boots! The grippy part was gone and he was now wearing our the squishy bit before getting down to the inner-soles and then his bare feet. Jane mentioned that it would be nice to know that were some other people around on their way down. I think she was a little more exhausted than I realised at the time. On the way down we picked up a trail from the saddle below Glacier Knob that led down the Restful Ridge route. We caught up to Jane as she was slightly nervously descending a snow filled gully. This is by no means unusual for people who have descended snow a lot. Mike and I assisted her down the snow section as both Graham and Jane were becoming concerned with reaching the chair-lift before it stopped operating at 4pm. After the snow section Mike and I ended up a little ahead, and following our noses headed further eastward to get back to the Waterfall t-bar that leads toward the Waterfall Express chair-lift. Having now lost sight if our British visitors we turned to see which route they were taking. They appeared to be moving toward a different chair-lift that was not operating, and also in a direction that was not a direct-line toward the car-park. While the conditions were good and their should have been sufficient time and light for them to change their direction and reach the car-park, knowing that they were tired and now probably suffering from a case of get-there-itice, it did seem prudent to assist them back to the Waterfall Express chair-lift. 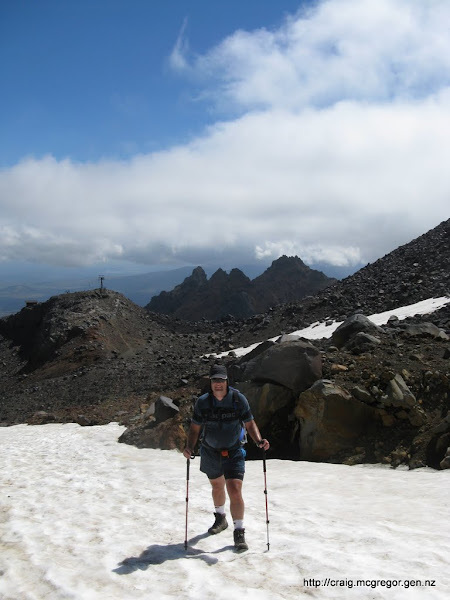 It wasn’t until we arrived home to Wellington that we read the media reports of a Greek tourist who had spent the previous night on the mountain. We scrambled down the moraine to where they were and assisted them in the direction of the chair-lift. Mike went ahead to let the chairlift operator know that we were coming and not to stop it. We were scampering over moraine less straight forward than where we had been but we were travelling in the right direction and managed to thread our way between the undesirably steep sections before crossing the stream, and onto a track in front of mound hosting the Alpine Club Hut. Form here there was a more worn route directed us to the Waterfall Express chairlift. Once at the chairlift, the friendly chair-lift operator, Jane and Graham convinced Mike and I to take the lift instead of walking as we had intended. Incidentally, the chairlift operator was also a marshal from the Ruapehu Classic cycle event the day before :). About 13 minutes down via the Waterfall Express and Rock Garden chair’s was probably saved us about half an hour of walking. Once back at the carpark, Jane and Graham kindly made us some coffee in their campervan which we enjoyed before the long drive back to Wellington. Thanks for the coffee, I hope you found some boots and that you are enjoying the rest of your holiday.